Read through the whole chapter before you come to the study. 2. 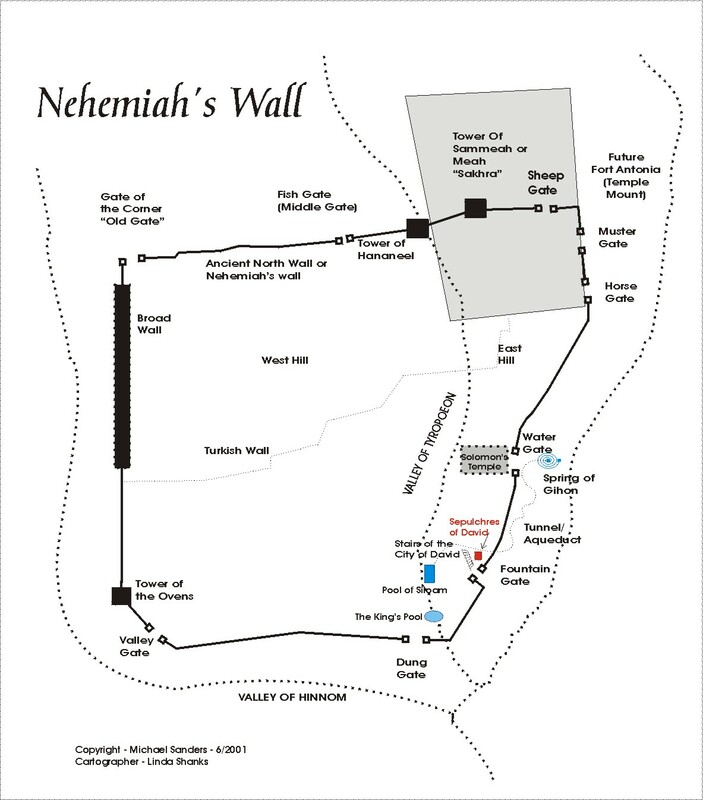 How did Nehemiah organize the groups? He organized the people in different ways some of these overlapped. First by residence- Close to Home v 10, etc. Second - Area of Interest, Getz Nehemiah p. 53 Eliashib the high priest and his brothers were assigned to rebuild the "Sheep Gate" v.1. This would be an assignment close to their own hearts,since it was through this gate that animals were brought to the temple for sacrifice. Third, Concentrated people where greatest damage existed. He put in place the leaders of the people or heads of households. 8 times the term official is used to indicate the type of leader that lead the group. The Priests began at the Sheep Gate. By it’s name, it probably was the place where the animals came in to the city for the sacrifices. Thus it was a significant location for them to work to restore so that the animals could once again come in for the sacrifices. The term “ over against his house” indicated that Nehemiah organized some of the people to work near their own house. They had a vested interest in getting their work done. Men from Jericho worked next to the priests. These men wanted the city of Jerusalem to be safe so that trade would flow through their city. Jericho was at the base of the road that ran up to Jerusalem. If no raiding parties were going up to Jerusalem, they would not be coming by Jericho. 28 times "next to him", "nextto them" or "after them" shows up but there are even more teams. The nobles from Tekoa could be some of the rich who had enslaved the people by lending them money with interest which was against the law. ( more about that in chapter 5) Were they too good to get their hands dirty? Were they too busy making money to sacrifice? We are not told but we see that even some of the most widely accepted projects do not get everyone involved for whatever reason. 8. Where were the teams from? Locate these places on the map. Print out the map that is at the end of this study and locate the different gates and where the teams were working. Go around the city wall and write verse number or the names of the teams or team leaders as you they are listed. The lists starts in the upper right hand corner and goes counter clockwise around the city. Another indication that Nehemiah was well organized in his reporting. He makes it easy to write down the groups as he has put them all in order and did not jump around from gate to gate. Nehemiah spaced the people out and it appears that in the most difficult place, along the east side, he had them working closer together. The women and children were supportive of what their older siblings and dads were doing. They show their support in later chapters when the trials and difficulties become intense. Shallum a leader of half of Jerusalem, had is daughters pitch in and help him get his part of the wall completed. He being a local leader would not have had difficulty getting his daughters married off which happened as early as 14 - 16. This would mean that his young daughters pitched in there and helped out. People working near their house would be able to get home for rest and meals. Jerusalem was large enough that it could take an hour or more to get from one side to the other. 13. Note that by identifying individuals as leaders or special commendation Nehemiah is a great encourager. Are you following the "encourage one another" principle found in the New Testament? Who could you encourage and how? Make a committment. The men in this study could all use some encouragement. They are challenged every day to live their life as dedicated, on-fire disciples. Encourage my wife and kids in their work and family. 14. What kind of co-operation can we expect from people for certain projects? Some help, get the job done quickly and go and help others. Other stand back and watch the work go by. There are givers and there are takers, which are you? If we get our job done well and quickly, go and help others or pick up another section of the work to complete. The great commission is to bring the good news of Jesus Christ to all people. What part are you having in this great responsibility which God has given to each believer? Are you doing your part. 16. Has the Lord laid any projects on your heart that we should as a group work together to accomplish? What are you doing to "rebuild the wall?" Are you a leader, head of a household, or occupation group? Why or why not? How are you leading your household to "minister unto God"? Family issues often get in the way of ministry. Some times our lack of leadership and protection leaves your family open to the attacks of the evil one. One way to include even the "nobles" is to find out what their gifts are and where their allegence is. If they are not sold on the project or ministry, they will not participate. You need to get buy in before you can expect them to be sold out for the project.